Grab this explosive co-op top-down shooter. This month, anyone who's part of the PC Gamer Club membership program gets a Steam key for fast-paced co-op top-down shooter Circuit Breakers. We’ve teamed up with our pals at Fanatical.com, a retailer of Steam keys and bundles, and publisher Excalibur to offer you this game. Circuit Breakers coincides with the release of Excalibur's forthcoming Flashing Lights - Police Fire EMS, an open world emergency services game that can be played in both single and multiplayer, which came out last week. 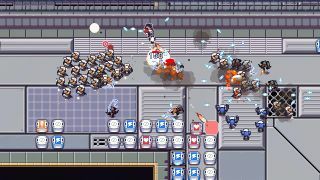 Circuit Breakers is a fast-paced multiplayer top down shoot 'em up. You can gather up to five friends and combine your powers to take down a deadly robot army. Members of the PC Gamer Club also get an ad-free version of the site, a digital version of the magazine to read every month, access to the exclusive PC Gamer Club Discord channel, and free in-game items from the likes of RuneScape, Elite Dangerous and more. Head here and find out more about joining up.